Now that I’ve covered the squat vs the leg press, traditional vs sumo deadlifts and pull-ups vs pulldowns, the next logical exercise is, of course, the bench press. To put the barbell bench press against the dumbbell or smith machine bench press was too similar an article to what my colleague Colin has already covered (a very worthy article to read if you want to know which of the three possibilities will suit your muscle-building needs best), so it made sense to me to instead post the bench press vs the dumbbell fly. When I first gave thought to these two exercises it made sense to me that the fly was actually the superior of the two exercises as far as building muscle is concerned. The function of your pectoral muscle is to draw your arms across your chest – exactly the same movement that the chest dumbbell fly accomplishes. What makes me think that this exercise is not the clear winner is looking around the gym. All of the big guys with the thick chests spend the majority of their time pressing and usually include some flies at the end of their workout as more of a shaping move of a finisher to get a pump. 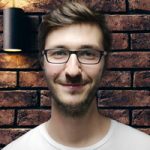 So which is it, which exercise is best for muscle development? 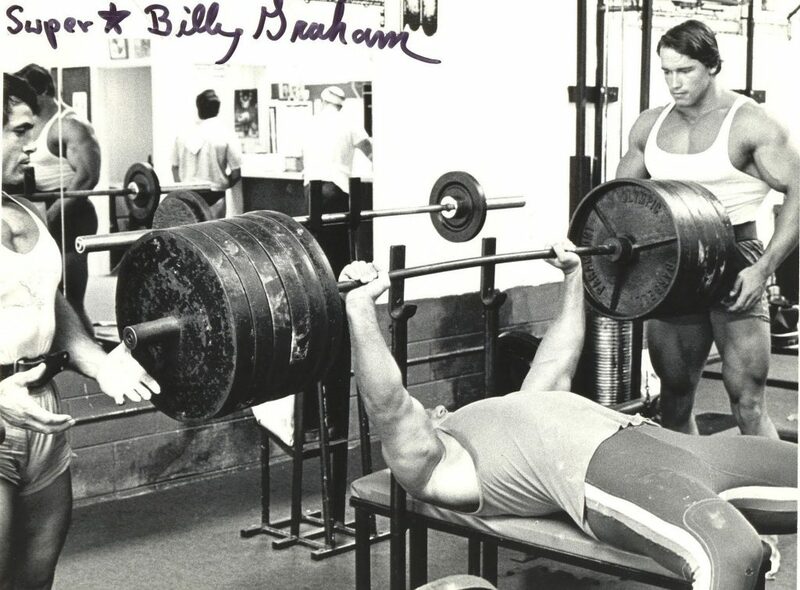 One thing is certain we all love the bench press. When I was in high school I remember periods of time when I bench pressed every day. Of course, I balanced this with lots of barbell curls to create a well-rounded physique (that was sarcasm in case there was any doubt). I can say with almost 100 percent certainty that the bench press is what drew all of us guys to the weight room and likely is what still keeps most of us there. It’s fun to do. You get to lay there and have your entire core stabilized by the bench and do what feels as simple as just using your arms to lower the bar down and then drive it up. Just thinking about it makes me want to bench. 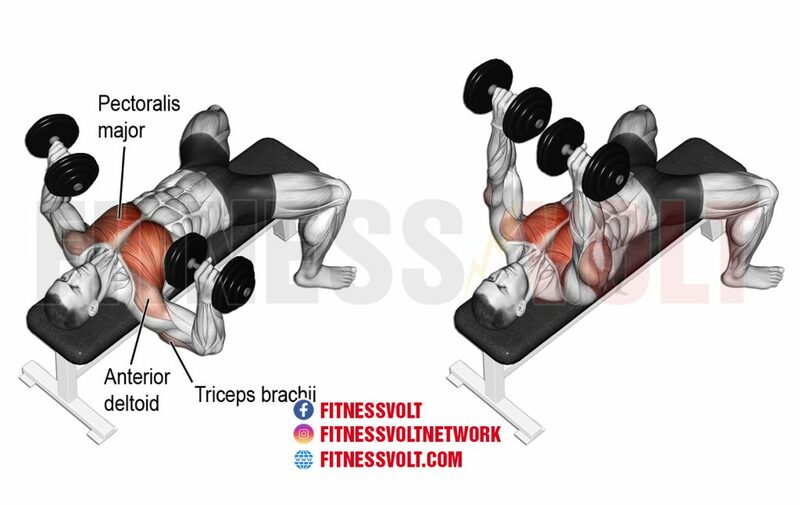 The advantage that the bench press has over the chest dumbbell fly is that is uses multiple large muscle groups making the exercise a true muscle mass builder. The bench press engages the entire pectoralis major, which is the large fan of muscle underneath your ‘breast’ that gives your chest its size and definition. It is the muscle that we think of when we think of our chest. The pectoralis minor is the smaller muscle that is located under your pectoralis major and is also worked when we bench press. Muscles of the shoulder and ribcage also are used such as the anterior deltoid, the serratus anterior, the coracobrachialis and the triceps as well. Your latissimus dorsi also assist in the press as does your core in order to provide spinal stability throughout the movement (the bench definitely helps, but the muscles of your core still need to contract if you want maximal stability which will translate into strength and power). What all this means is that the bench press is a great exercise for building strength. You need to use a lot of upper body strength in order to hold the weighted bar directly above you and because there are so many muscles involved it means that you will be able to lift a fairly large amount of weight. This strength that you can build means that you can easily build muscle with this movement. The push portion of the bench press comes from the middle of your chest meaning it’s effective for developing chest thickness. Your chest will literally build more depth as opposed to width. Front to back size and not side-to-side. 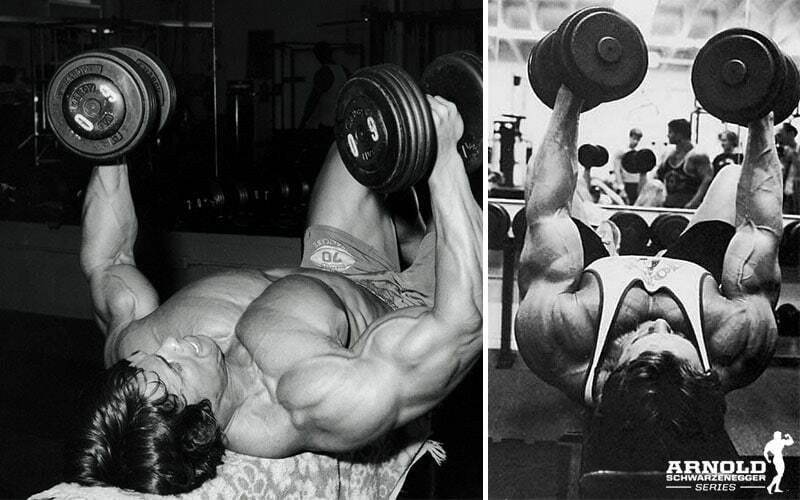 The chest dumbbell fly, however, builds chest width. You are bringing the weight out to the side of your body that engages the outer portion of the pectoralis major. As this exercise is often performed with lighter weights it can be used as an endurance builder. Of course the bench press can too but for the most part we tend to do that exercise as heavy as we can. There are some things we just can’t seem to change. Another very big benefit to doing chest dumbbell flies is that it can increase thoracic expansion, which increases the size of our chest cavity (much in the same way the underutilized pullover does). This means that you can actually increase lung capacity by doing chest flies. As mentioned above, the exercise works the outer portion of the chest muscles so this creates the width that the bench press doesn’t. This, of course, will accentuate the desired v-taper that all of us want, regardless of our individual goals. I don’t even feel I need to write a conclusion to this article as it pretty much just summed itself up all by itself. You obviously need to do both the bench press and the dumbbell fly in order to build a thick, wide chest and increase your lung capacity in the process. In this Vs battle, there is no clear winner. By doing one and not the other you are cheating yourself out of the full muscular development that you undoubtedly seek.